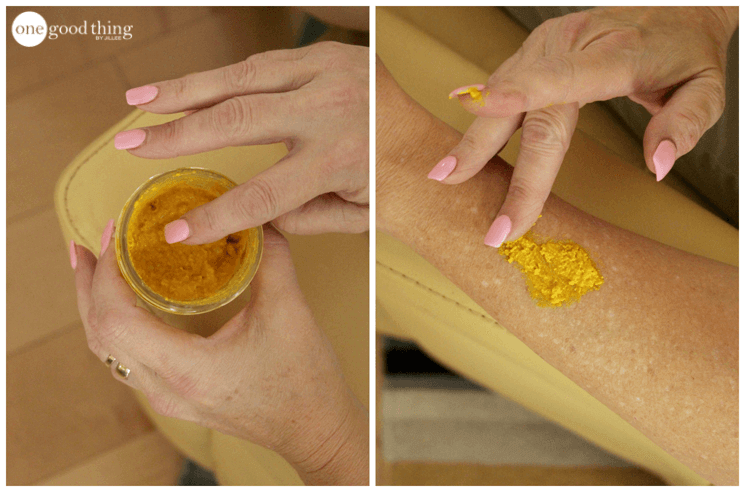 Turn back the clock on your skin with this easy homemade remedy. I recently received an email from a reader named Amy, who asked if I had an effective natural remedies for sun damage and age spots. I didn’t have one to offer her off the top of my head, but I was excited about the idea! So I set about doing some online research – not just for Amy’s benefit, but for my own as well! As most “women of a certain age” know, protecting our skin from the sun was not very high on our list of priorities back when we were growing up. I grew up in Southern California, and spent most of my time outside without a second thought about sunscreen. I’ve been fortunate enough to avoid any seriously negative effects from my childhood sun exposure, but I do have plenty of sun spots and age spots to show for it! So when I read Amy’s email, I knew that finding an natural remedy for age spots would ultimately be helpful for both of us! I’ve heard of natural remedies for skin discoloration before, but I hadn’t attempted to make any of them until now. After reading dozens of different formulas online, I’ve come up with the following recipe. Now Amy and I (and you, too!) can safely and naturally fade those unsightly skin spots. But before I show you how to make it, let’s talk about what goes into it. The bases of this skin treatment are plain yogurt and ground oatmeal. Yogurt contains lactic acid, which helps slough off dead skin cells and reveal the new, healthy skin underneath. Oats can benefit skin in two ways. First, the oat pieces help to exfoliate dead and dull skin, and second, they actually provide additional moisture to your skin, helping to keep it hydrated. The two other ingredients in this recipe are turmeric and lemon juice, both of which have lightening properties. These ingredients help fade dark spots and discoloration over time. However, these ingredients (lemon juice in particular) can increase your chances of getting sunburned. Because of this, I recommended that you only apply this treatment at night, and use plenty of sunscreen on your face during the daytime. Combine the yogurt, oatmeal, turmeric, and lemon juice in a small bowl. Stir until well combined. Apply the mixture to the affected areas on your skin, and allow it to sit there for about 30 minutes. Everyone’s skin is unique, and will respond to some ingredients better than others. Follow the link below for a list of ingredients that are great for aging skin, so you can start formulating your own custom remedies! I used a cotton ball and hydrogen peroxide to lighten an age spot on my face and wished I had used a Q-tip. The reason, it also lightened some of the skin around it where I had gotten a suntan. Oops. Anyway, hydrogen peroxide is working for me. Do you suppose this would work for mosquito bite discoloration? I’m not sure, but it’s worth a try! Going to try this on a age spot on my face. It’s really annoying to me and makeup can’t even cover it. Asking for another skin issue. Do you have any remedies for removing skin tags safely and painlessly. I don’t have one yet – I’ll have to start researching! I assume, since it has yogurt in it, that it needs to be stored in the refrigerator between uses? The recipe calls for ground oatmeal. Does that mean your putting in the blender or food processor? I would love to see a “before and after” picture!! !